The grounds at Kay-Nah-Chi-Wah-Nung contain the remains of a large oak prairie savannah that once stretched along Manidoo Ziibi. This mesic prairie vegetation was common in the area until it was cleared for agriculture in the 1800s. The Ojibway communities living near Kay-Nah-Chi-Wah-Nung during this time began conducting yearly burns to preserve the now unique habitat. A globally significant oak savannah prairie is nestled between the Long Sault Rapids and mixed woodland habitats at Kay-Nah-Chi-Wah-Nung. 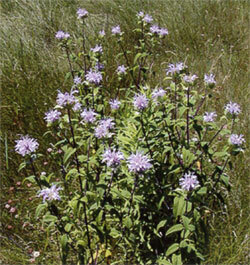 This unique plant community is home to many of Ontario’s rare plants, including Oval Leafed Milkweed, Hoary Puccoon, and Wild Licorice. Today, preservation of this site is ensured through the stewardship efforts of the Rainy River First Nations. The prairie is burned each spring to mimic the traditional yearly burns. These burns facilitate the growth of native prairie plants while inhibiting the encroachment of invasive species. This website can be used as a resource guide to the plants found at Kay-Nah-Chi-Wah-Nung. These plants are found scattered along the trails, and have been included within this guide due to their traditional, medicinal, or interesting properties. Stout, rough, and branching stems with large golden-yellow flower heads. Heads 7.5 cm (3 inches) wide with 10-20 ray flowers; narrow and spreading bracts beneath heads. Common from August to October. Ovate to lanceolate in shape, 10-25 cm (4-10 inches) long. Thick, rough, and toothed in opposite and alternative patterns. Winged stalks and three main veins. 1.5-3.0 m (5-10 feet) tall. Throughout eastern Canada, excluding far north. Northwestern United States. Tuber is edible and highly nutritious. Unlike potatoes, it is made of simple sugars (carbohydrates) which more easily metabolize into natural sugars. They are said to be delicious when boiled or roasted like their starchier cousin. They have a sweet, nut-like taste and are high in iron. It is ideal for diabetics as it does not increase glucose levels when ingested. Herbaceous perennial plant with well-known yellow-flower heads that become round balls of silver tufts that disperse easily in the wind. Solitary flower heads with numerous yellow ray flowers. The stalk is leafless and hollow and grows from a rosette of toothed leaves. Stem juice is milky. Long, lanceolate leaves, broadest near tips, with jagged and backward-pointed lobes or teeth. 5-50 cm (2-20 inches) tall. Lawns, pastures, fields, and roadsides. Throughout North America; rare in extreme southeastern United States. Dandelion originates from dent de lion, French for ‘lion’s teeth,’ referring to the teeth on the leaves. This plant has many uses in both nutritional and medicinal contexts. The leaves, roots, and flowers can be eaten and are extremely nutritious. Young to just-matured leaves are edible raw in salads or sandwiches, while the crown can be eaten as a separate hot vegetable. It should be steamed or boiled to decrease the bitter taste. The roots are commonly roasted to make non-caffeinated coffee. Medicinally, it can be used as an herbal remedy for both internal and external ailments. It can be used in the treatment of gall bladder and urinary disorders, gallstones, jaundice, cirrhosis, dyspepsia with constipation, diseases associated with high blood pressure and heart weakness, chronic joint and skin complaints, gout, eczema, and acne. Perennial plant with several stems rising from the root. 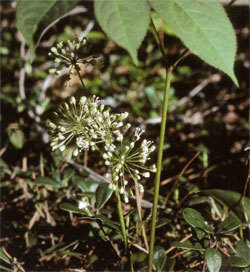 Stems are green in color, can be slightly red-tinged, and are ringed with dense spikes of white or pinkish flowers. Leaves are numerous, alternate, and linear-shaped. Seeds are produced in capsules. Grown in spikes that are 2 cm (&frac18; inch)long. Leaves can be several inches in length. Common from April to July. Alternate, lance to oblong-shaped, 2.5-5.0 cm (1-2 inches) long. Thin in texture and stemless. 15-60 cm (½-2 feet) tall. Dry woods, limestone or rocky soils, higher altitudes. From Minnesota to New Brunswick and western New England; along the Canadian Rocky Mountains, the Allegheny Mountains (North Carolina), and in Missouri. Traditionally used to treat snakebites. Also used for earaches, toothaches, sore throats, croup, and colds. Its main use today is as an expectorant in cough syrups, teas, and lozenges, as well as a gargle for sore throats. It has been used as an emetic and cathartic in larger doses. Three to five broad, parallel and veined leaves along the stem. Yellow flower with distinctive pouch-shape. Yellow lip petal in pouch form, similar in appearance to a slipper or moccasin, 2.5-5.0 cm (1-2 inches) long. Common from May to June. Three to five bright green oval leaves with strong ribbing. 15-80 cm (5 ½-31 ¼ inches) tall. Rich deciduous woods. Boggy and swampy areas further north. 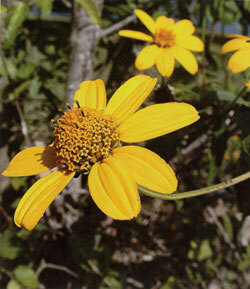 Rarely found in clay-rich soils and has preference for limestone-rich areas. Minnesota to Nova Scotia and New England. Along the mountains to Georgia, as well as Alabama, Tennessee, and Missouri. Insects enter through the moccasin-shaped pouch but can only exit through the rear, collecting pollen to distribute in the process. The nerve root is reputed to have effects on the nervous system, and is pungently bitter-sweet with an unpleasant odor. It is antispasmodic and diaphoretic, and has been used as both a sedative and tonic. Taken internally it has been used in the treatment of anxiety, nervous tension, insomnia, depression, and tension headaches. It is best taken as a tincture as the active ingredients are not water soluble. The plant is said to be a less powerful equivalent of Valerian (Veleriana officinalis) in its effect as a nervine and sedative. Roots are harvested in the autumn and dried for later use. For conservation purposes is best not to use this herb unless you can be positive that it was obtained from a cultivated source. An Ojibway legend tells of a little Ojibway girl lost outside during a bitterly cold winter. 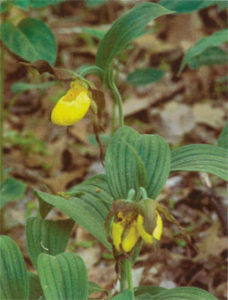 Searchers found a Lady’s Slipper blooming in the snow, where the little girl was last seen. The Lady's Slipper has become the model for the Ojibway Moccasin based on this legend. Robust, large aquatic grass. Produces submerged, floating, and aerial leaves. Sturdy, woody stem with tall spike emerging from grass stalk. Heads are small and yellowish-green, turning a dark purple thick with seeds as they mature. They are monoecious and pollinated by the wind. Flowers from July to September; seeds ripen from September to October. Up to 3.5 m (10-12 feet). Shallow waters and lakes with slow-moving currents. Sandy, loamy, or clay-rich soils with neutral pH levels are preferred (although slightly acidic or basic soils will still produce plants). Eastern North America, particulary from Manitoba to New Brunswick, and from Texas to Florida. Wild rice is a staple food of the First Nations and is used in the same ways as other rice. The seed is cooked and eaten, and is sometimes added to rice dishes for flavoring. It can be ground into a meal and used in making bread or thickening soups, and is a rich source of riboflavin and niacin. The base of the culms is used as a vegetable. While this plant is not found at the Mounds, it remains a highly important plant for sustenance in the area. Herbaceous, early blooming prairie plant which has a tendency to sprawl across the ground. Stems are covered with long white hairs. Leaves have sparse white hairs on their upper sides, ciliate hairs along their margins, and a white pubescence on their undersides. The flowers occur in showy clusters at the ends of major stems, and are bright yellow to yellowish orange. The root system consists of a central taproot. Heads are up to 1.3 cm (½ inch) wide. Lower half is fused into a tube, hiding the stamen. Flowers arranged in a flat-top cluster with no noticeable floral scent. Common from April to June. Alternate, up to 6 cm (2 ¼ inches) in length. 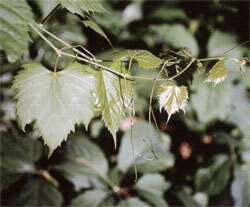 Leaves are narrow and hairy with prominent central veins and an absence of serration along the margins. Oblong with rounded tips. 15-45 cm (6-18 inches) tall. Dry open woods, thickets, and glades. Virgin prairie remnants preferred. Rare or absent in all other habitats. Saskatchewan to southern Ontario, primarily in the Mississippi Valley. Also present in Georgia and Texas. 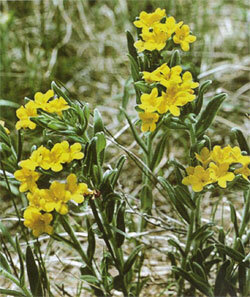 ‘Puccoon’ is a Native American term applied to several plants which are used for making reddish pigment. The long taproot and seeds of this plant look like small pieces of bone or ivory, and can be used in rattles. Flowering stalks that grow in three finger-like structures. Deep roots help the plant survive droughts, and can reach up to 3.6 m (12 feet) in depth. Reproduces primarily through rhizomes and are found growing in clumps. Purplish flowers are at the top of the stalks, usually in 3-4 tight clusters from a central point. Common August through September. Flat, 30-60 cm (6 to 24 inches) long, 6.6-17.0 mm (&frac15; - ½ inch) wide, usually glabrous on the underside and scabrous (rough) above, with rough margins, and hairy at the collar. Deep, fertile, and dry prairie soils are preferred. More frequent in lowland prairies, but can also be seen on shallow, gravelly ridges during wetter periods. 60-180 cm (2-6 feet) tall. Common from Oklahoma in the United States up to Canada. Used to treat digestive problems and fevers. 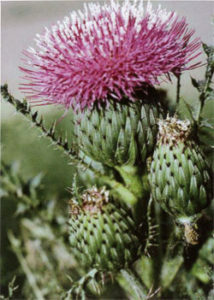 Latin: Cirsium arvense (L.) Scop. Numerous pale magenta to lavender flower heads top this high-branched, smooth-stemmed plant. Very fragrant. Heads 2.5 cm (1 inch) wide, all disk type petals. Surrounded by spine-tipped bracts. Common from June to October. Spiny and lanceolate in shape, long and grey-green with matted hair. 12.5-20.0 cm (5-8 inches) in length, wavy-edged, and mostly stalkless. 30-150 cm (1-5 feet) tall. Throughout North America, excluding the far north of Canada and the southeastern United States. Introduced by Europeans. Distinguished from bull thistle (C. vulgare) by smaller flowering heads and non-spiny stems. Thistle roots have been used as tonics, diuretics, astringents, and hepatics. It has also been chewed for treating toothaches, and the seed fluff is useful as tinder for starting fires. Waxy-white blossom; one of the first spring flowers to bloom, appearing shortly after the snowmelt wrapped in a grayish-green leaf. Perennial plant with thick, horizontal rootstock. 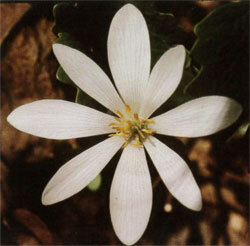 A single leaf and flower are produced, the undersides of which are paler and show prominent veins. Blood-red juice is within the stem and root. Hermaphroditic flowers, 2.5 cm (1 inch) across. Blooms in April. Palmate with five to nine lobes. Lobes cleft at the apex or along the wavy margin. Leaf stems measure 12.5-35.0 cm (5-14 inches) long. Leaves continue to grow after flowering to a maximum of 10.0-17.5 cm (4-7 inches) long and 15-30 cm (6-12 inches) broad. 20-30 cm (6 inches) tall. Woodland habitats with variable degrees of shade. Traditional remedy in the treatment of fevers, blood disorders, and rheumatism. Used to induce vomiting and as an element in divination. In modern herbalism is it chiefly used as an expectorant, promoting coughing and the clearing of mucus from the respiratory tract. Externally, the root is used in the treatment of skin diseases, warts, nasal polyps, benign skin tumors, and sore throats. It is also used as a natural dye. The root is toxic and contains a number of opium-like alkaloids that are also found in other members of this family. An excessive dose depresses the central nervous system and causes nausea and vomiting which may become fatal. This remedy should not be prescribed for pregnant or lactating women. Fresh or dried sap can cause intense irritation to the mucous membranes. 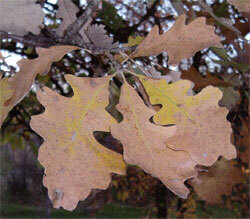 Large oak tree with fiddle-shaped leathery leaves and very large, fringed acorns. Deeply ridged bark and thick to corky twigs. Monoecious; male flowers are yellow-green with long, slender catkins 5-10 cm (2-4 inches) in length. Female flowers are green tinged with red and appear as single, short spikes. Both appear shortly after the leaves. Alternate, simple, 15-30 cm (6-12 inches) long. Roughly obovate in shape with many lobes. The two middle sinuses nearly reach the midrib and divide the leaves nearly in half. The lobes near the tip resemble a crown, and are green above and paler and fuzzy below. Acorns are 2 cm long (1 ½ inches) and half enclosed in a warty cap that has a long-fringed margin. They mature in a single growing season in later summer to fall. Often reaches over 30 m (100 feet) tall with a long, clear bole. In open areas it becomes a very wide, spreading tree. Dry uplands on sandy and loamy soils. Widely distributed throughout the eastern United States and across the Great Plains. It ranges from southern New Brunswick, central Maine, Vermont and southern Quebec; west through Ontario to southern Manitoba and extreme southeastern Saskatchewan; south to North Dakota, extreme southeastern Montana, northeastern Wyoming, South Dakota, central Nebraska, western Oklahoma, and southeastern Texas; then northeast to Arkansas, central Tennessee, West Virginia, Maryland, Pennsylvania and Connecticut. It also grows in Louisiana and Alabama. Oaks have a variety of uses. The bark can be brewed into a tea for diarrhea, and the scraped and dried inner bark can be made into a tea to relieve heart symptoms. It was also used to make red and black dye. The nut meat can be ground for use in grits or meal, or pounded into a paste. It has also been known to help heal open wounds. Grows at ground level between two leafstalks; single dark reddish-brown to green-brown flower. Cup-shaped with three pointed lobes. 3.8 cm (1 ½ inch) wide. Paired; large, hairy, and heart-shaped. Each leaf is 7.5-15.0 cm (3-6 inches) wide and they overshadow the flower. Quebec to New Brunswick in Canada; south to South Carolina, west through Kentucky to Missouri, and north to Minnesota. A very important and useful plant. The root of the spring flower has a strong ginger-like odour, and candy can be made by simmering the rootstalks in sugar. Medicinally, it has been used to treat whooping cough, dress wounds, settle the stomach, and ease childbirth. When the Rainy River was heavily populated with sturgeon, fishermen would chew wild ginger to keep the sturgeon away from the boats and prevent them from tipping them over. Touching this plant can cause skin irritation in some people. Lavender, purple, or white cup-shaped flowers; solitary or in few-flowered terminal clusters. Consists of five regular parts and are up to 4 cm (1 ½ inches) long. Ranges from blue to violet in color. The corolla appears completely closed but can be open at the top. Common from August to September. Opposite arrangement, lanceolate shape. Leaves up to 10 cm (4 inches) in length and are stemless. 61 cm (24 inches) tall. Moist fields or open woods. The bitter root has long been used as a tonic and is known to be an appetite stimulant. It was also used as a cathartic and laxative as well as to treat weak stomachs and, oddly, hysterical affections. 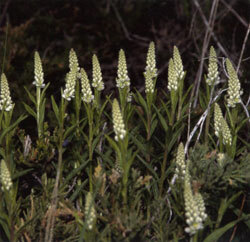 Flat-topped clusters of small, whitish flowers at the top of a gray-green, leafy, hair-covered stem. Flower heads are approximately 6 mm (¼ inch) across. Four to six small flowers surround a tiny central disk. Common from June to September. Lanceolate in shape and aromatic. Approximately 15 cm (6 inches) in length, fern-like and stalkless. Basal leaves are longer. 30-90 cm (1-3 feet) tall. Disturbed patches of land, i.e. grown-over fields or ditches. Most of temperate North America. Yarrow has been used for a variety of medicinal purposes including the treatment of fever, headaches, hemorrhaging and rashes. When steeped, the leaves can ease stomach discomfort. It was often used in combination with other plants, and the foliage has a pleasant smell when crushed. Long, thin stems (runners), small white flowers, long stalks, and 3-parted basal leaves help identify this plant prior to the formation of its very identifiable berries. 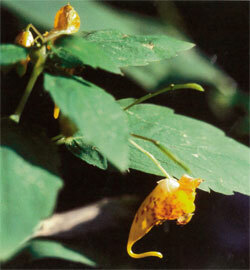 2 cm (¾ inch) wide with five sepals, five petals, and numerous pistils on a dome-like structure. Common from April to June. Small leaflets 2.5-3.8 cm (1-1 ½ inches) long with toothed appearance and hairy stalks. Dry and seed-like with an enlarged, fleshy cone (commonly known as a strawberry). 7.5-15.0 cm (3-6 inches) tall. Open fields and along the edge of woodlands. 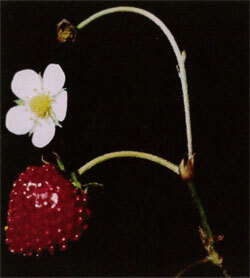 The edible portion of the strawberry is actually the central portion of the flower. The fruit enlarges with maturity and is covered with small embedded seeds. Cultivated strawberries are hybrids developed from multiple native species from North and South America. Tea made from the leaves may stimulate the appetite, and it has also been used to treat cholera. Traditionally, unripe strawberries were picked at the beginning of a women’s fast. The fast would take place for ten days and the strawberries would be eaten upon completion to replenish their bodies. Strawberries are the first summer fruit and signify the new season. Tall, leafy plant with translucent stems. Pale yellow flowers hang from the stems and occasionally haves reddish-brown markings. Typically 4 cm (1 ½ inches) long with a long calyx tube ending in a short hooked spur. Common from June to October. Long, thin leaves with ovate shape and toothed edges. 2.5-10.0 cm (1-4 inches) in length. Very fragile with swollen appearance. Elliptical capsule explodes at maturity, expelling seeds. 90-180 cm (3-6 feet) tall. Wet woods, meadows, and shaded rocky areas. Ontario to Nova Scotia in Canada, and between Oklahoma, Georgia, and North Dakota in the United States. All parts of the plant are diuretic, emetic, and purgative. While the leaves and seeds can be cooked and eaten in some Asian dishes, caution is advised. Sap from the plant has been used to treat nettle stings and poison ivy rash. It has also been used in the treatment of warts, corns, ringworm, and hemorrhoids. Regular ingestion of large quantities of this plant can be dangerous due to the high content of calcium oxalate (microscopic needle-like crystals). These are harmful when raw but can be destroyed by thoroughly cooking or drying the plant. Those with rheumatism, arthritis, gout, kidney stones, or hyperacidity should take special care if including this plant in their diet. Erect perennial with flat-topped clusters of bright orange-yellow button-like flower heads. Heads are approximately 1.3 cm (½ inch) wide and are composed entirely of disk flowers. Ray-like extensions develop from marginal flowers. Common from July to September. Divided into linear, toothed segments measuring 10-20 cm (4-8 inches) long. Strongly aromatic. 60-90 cm (2-3 feet) tall. Roadsides and the edges of fields. Common throughout North America excluding the southernmost and northernmost regions. Young leaves and flowers have been used as a substitute for sage in cooking when fresh, however given the potential toxicity of this plant, ingesting it is not recommended. It has been used for sore throats, women’s diseases, fevers, and earaches. Extracts from the plant can be used as a natural pesticide to keep insects from vegetables. Tansy is very invasive at the Mounds and can out-compete other plants. 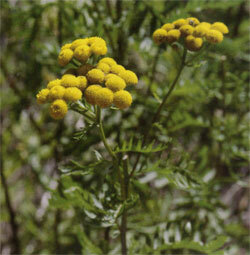 Tansy and its herbal extracts can be poisonous, even fatal, to humans. It has been used for centuries to medically induce abortions with occasionally fatal results. The bitter tasting leaves and stems contain tanacetum, an oil which is toxic to humans and animals. 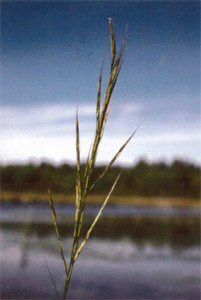 Densely tufted grass with smooth, erect stems topped with pyramidal clusters of ovoid, green spikelets. Branches are thread-like, spreading, or ascending. Very small, petal-less flowers with six stamens and two styles. 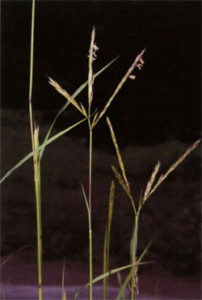 The flowers are enclosed in scales which are grouped into spikelets at the ends of branches. Form in clusters up to 15 cm (6 inches) long. Common from May to August. Wide leaves on basal portions of the stem; up to 20 cm (8 inches) long and 6 mm (&frac16; inch) wide. Moist or dry soils, meadows, and fields. Often cultivated as a lawn or pasture. Different species of grass (Poa) are often difficult to distinguish from one another by the untrained eye. This grass is common at Kay-Nah-Chi-Wah-Nung and tends to out-compete other species, reducing biodiversity. Herbaceous perennial plant with fragrant leaves and purple to lavender, two-lipped tubular flowers. 4 cm (1 ½ inches) long. Very attractive to bees and hummingbirds. Common from July to August. Lance-shaped and toothed. Approximately 5-10 cm (2-4 inches) in length. 60-120 cm (2-4 feet) tall. Dry soils; usually in dry woods, thickets, and forest clearings. When steeped, the leaves of the plant have been used to make a strong mint-flavoured tea with a number of medicinal qualities (1 teaspoon dried leaves to 8 ounces boiling water). It was often used for insect repellent, as well as for treating burns and digestive problems. Fresh leaves can be added in small quantities to salads, desserts, and beverages. Herbaceous perennial plant with a stout woody stem topped by a single leaf above the flower stalk. Two to seven (average of three) umbrella or ball-shaped clusters on top of a leafless stalk. Individual flowers are very small with five greenish-white petals. Common from May to June. Single leaf comprised of three to five leaflets. Leaflets are elongated lance or egg-shaped and are finely toothed along the margins. Berries are nearly black when ripe and are found in clusters. They are edible, but not very palatable, and ripen during mid-summer. 50 cm (19 inches) tall. Broad range of soil and site conditions; most common in dry to moist hardwood or mixed wood forests. Common from British Columbia to Newfoundland in Canada, and from North Carolina to the Intermountain West in the United States. The rhizome of the plant was traditionally used as both food and medicine. 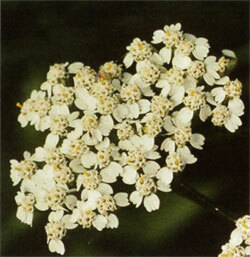 It was used in the treatment of a variety of ailments including shingles, recent wounds, coughs, and ulcers. The berries were used by European settlers to make wine, and an early form of root beer was made from the rhizome. The plant was used as a popular spring tonic in the 1800’s. Tall, leafy stem with fine hairs and tiny yellow flower heads at the ends of arching branches in long or flat-topped clusters. Flower heads 3 mm (&frac18; inch) in length and have three short rays. Common from May to September. Lanceolate in shape, 5.0-12.5 cm (1-5 inches) long. Covered with fine hair and prominent veins. Across Canada and throughout the United States. 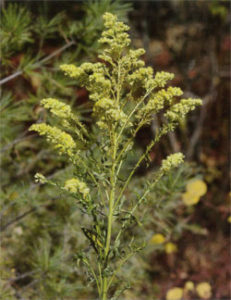 Although this plant is often blamed for hay fever, the discomfort is usually the result of pollen from Ragweed (Ambrosia spp.) which are smaller plants with green flowers that bloom at the same time. Poultices made from the flowers or the moistened, crushed root have been used to treat ulcers, burns, and boils, respectively. 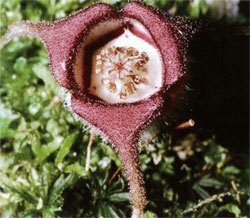 It has also been used in the treatment of some cancers, and the leaves are a source of latex and rubber. Small to medium-sized, broad-leaved hardwood with small, open crowns of spreading and ascending branches. Branchlets are slender and reddy-brown in color. Trunk bark of young trees is reddish-brown but turns to its characteristic white color as the tree matures. Staminate flowers are preformed in catkins 2.0-2.5 cm (¾ to 1 inch) long at the ends of twigs and lateral shoots in the late summer. These mature and grow in length to 4-10 cm (1 ½-4 inches) the following spring. Alternate, simple, pinnately-veined, and ovate with acute tips and rounded bases. Petiole is slender. Averaging 16 m (54 feet) tall. Most common in well-drained sandy soils, but can tolerate a wide range of soil textures ranging from gravel and silt to organic bogs or peat soils. Common across Canada and southern Alaska, as well as most of the northern United States. Small paper birch populations are found in Colorado, Montana, the Eastern Cascades, the Great Lakes states, and North Carolina. 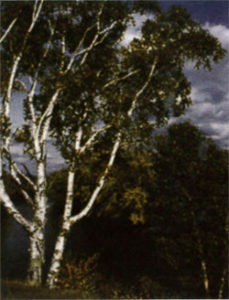 Paper birch has been used as a food source, a wood source, and a medicinal source. Sap from the tree can be boiled down to make a sweet syrup, and has been collected to make wine, beer, spirits, soft drinks, and health tonics. In an emergency, the tender inner bark can be eaten for sustenance. The outer bark was fashioned into baskets, storage containers, mats, baby carriers, moose and bird calls, torches, household utensils, and canoes. The strong yet flexible wood was often worked into weapons such as spears, bows, and arrows. Birch bark resin has disinfectant properties and slightly energizing effects, and is sometimes chewed for these reasons. It can also be used to alleviate stomach pains. Please use caution when preparing or eating any part of a plant. Identification of the species and knowledge of a plant’s toxicity are both essential before using any plant species medicinally or otherwise. Please consult with a health professional before attempting to treat any ailment. Tall stem bearing a panicle of flower heads with numerous white rays (sometimes tinged violet). Heads 2.0-2.5 cm (¾-1 inch) wide. Central disk yellowish to pinkish; bracts narrow and green-tipped. Flowers are spread out, but not on one side of the stem. Common from August to September. Lanceolate, sharply pointed, and sometimes toothed. Short-stalked. Lower leaves 7.5-15.0 cm (3-6 inches) long, upper leaves slightly smaller. 1.2-1.5 m (4-5 feet) tall. Damp roadside ditches and thickets. Throughout much of North America, excluding the far north. 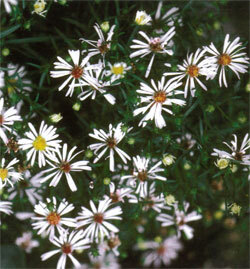 An infusion of panicled aster combined with other plants has been used to treat fever. A decoction of the plant has been used to dress wounds, and when dried and powdered it has been used as a salve on abrasions. Smoke from the crushed blossoms has been inhaled in the treatment of nosebleeds. Tall plant with a sticky, hair-covered stem. Brown fruits with hooked spines on the branches. Cream-colored, similar to alfalfa, crowded on the terminal spike. Common from June to July. Opposite and on long stems. Prairies, stream valleys, roadsides; moist and sandy areas. British Columbia to western Ontario; southern to northwestern Missouri, north Arkansas, Texas, Mexico, and California. The root can be eaten raw or cooked, and contains 6% glycyrrhizin, a substance that is 50x sweeter than sugar. It is sweet and fleshy, and when slow roasted is said to taste like sweet potatoes. Tender young shoots can be eaten raw in the spring. 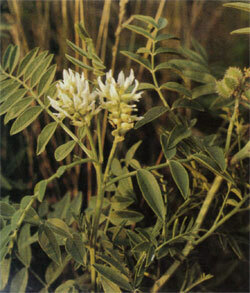 Despite the name, wild licorice root is not used for the production of commercial licorice. 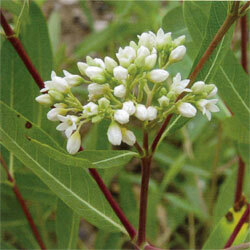 The plant has been used as a birthing aid, as well as for foot care, toothaches, and the treatment of skin sores. 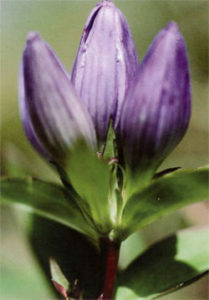 Sturdy, erect, purplish stem with ascending branches in the upper region. Long oval leaves with white coating or bloom similar to plums. Small cream-colored flowers are clustered at the ends of branches or on stalks from the leaf axils. Tufted seeds form spindle-shaped pods. Small, white to greenish-white, and produced in terminal clusters (cymes). The flower size is 1 cm (¼ inch) wide. 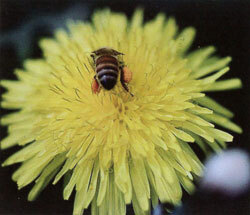 Pollinated by small insects including wasps and flies. Common from May to August. Ovate or elliptical margins, 5-12 cm (2-5 inches) long and 1-4 cm (½ to 1 ½ inches) wide. Opposite pattern. Short petioles (stems) on leaves with no hairs underneath. Lower leaves are stemmed, upper leaves are not. Leaves turn yellow and drop in the fall. 1.0-1.2 m (3-4 feet) tall. Roadsides, thickets, fields, lakeshores, waterways; disturbed areas. Throughout the United States and scattered across Canada. Cordage and twine made from this plant were extremely useful and frequently used prior to the widespread use of cotton. Twine was particularly excellent for making fishing lines and nets because it kept its strength under water and did not shrink. It was used in the manufacture of many other items, including deer and rabbit nets, small-game slings, nooses for bird hunting, hide stretchers, bowstrings, moccasins, clothing, straps, bedding for baby cradles, wheels for dart games, carrying nets, and cattail mats. Medically, it was used to treat coughs. This plant can be fatal to animals if eaten. Other plants in this genus have poisoned humans, and this species should not be ingested. Woody vines with trailing or climbing tendrils. Mature stems are thick in diameter; young branches are green to dull reddish-brown. Inconspicuous, greenish, and fragrant. Calyces are short with five petals attached at the tips. Separate at the bases. Alternate, simple, thin, and heart to egg-shaped. 7-15 cm (3-5 inches) long and wide, with three to seven tapered-point lobes. Shiny and green on upper surface, green and pubescent along veins of lower surface. Margins are closely toothed. 6-12 mm (&frac16;-&frac13; inch) in diameter; formed in fairly large bunches. Up to 15 m (50 feet) long. Moist to mesic black prairie soil, woodland edges or openings, sandy woodland edges or openings, savannah, sand dunes, thickets, shorelines, abandoned fields, and ditches. Eastern and central North America. Can be eaten raw or dried for later use. Fruit is juicy and slightly acidic, and is best following a frost. Leaves can be cooked, and young leaves can be wrapped around other foods while baked. Young tendrils can be eaten raw or cooked, and the sap can be used as a drink and is harvested throughout the spring and summer. Quantity decreases throughout the summer. Yellow dye can be made from fresh or dried leaves. Our staff and community work tirelessly to preserve the natural flora on our trails and we ask that our visitors refrain from collecting plants on the grounds of Kay-Nah-Chi-Wah-Nung. Many of the plants on our trails can have adverse effects if used improperly, so please exercise caution when exploring. The staff at Kay-Nah-Chi-Wah-Nung cannot take responsibility for any adverse effects from the use of plants described within this guide. It is illegal to collect plants, mushrooms, berries, animals, animal parts (including antlers), fossils, driftwood, rocks, signs, or any other historic or natural object in a National Historic Site. If you believe you have found something significant, leave the item in place and report your finding to Kay-Nah-Chi-Wah-Nung staff. Please leave these natural items for others to enjoy.